I was looking up a recipe for Eggs Benedict on allrecipes.com when I saw the word “dumplings” on the side of my screen. Now, keep in mind that I am from Savannah, GA. Anything that includes the word “dumplings” (or dimplins, as I say) in the title or recipe, I am going to love. 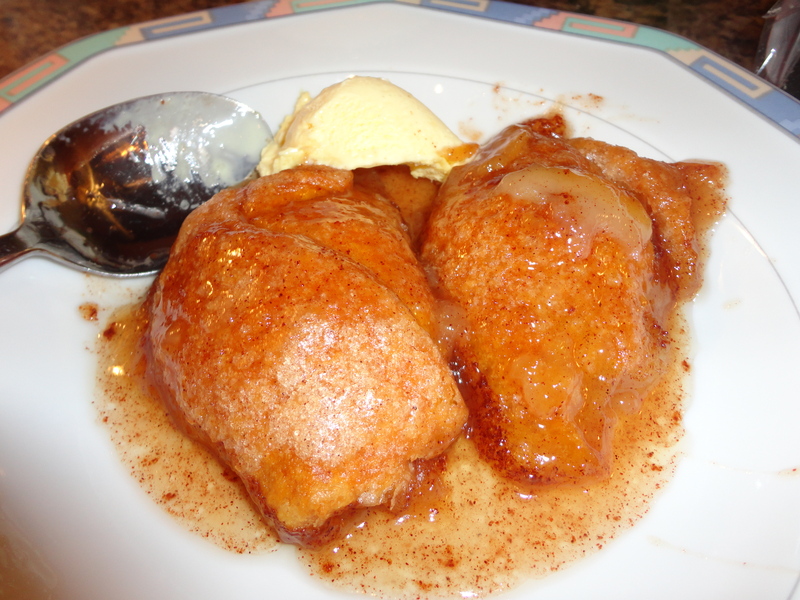 The recipe was for something called Apple Dumplings, which I had never heard of but sounded wonderful. I was heading to the store that evening already, so I went ahead and jotted down the ingredients to pick up while I was out. And decided to make it. And it was AMAZING. Most of the ingredients you more than likely already have in your kitchen. 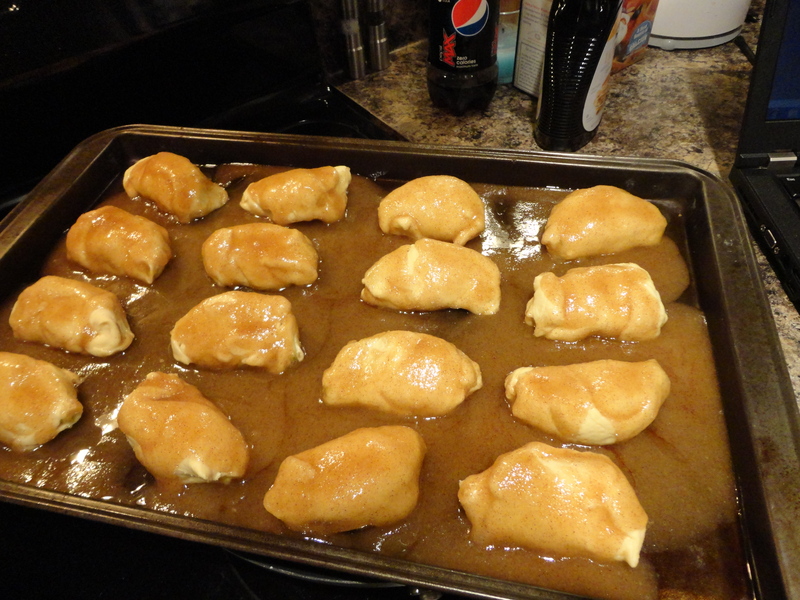 You will need 2 granny smith apples, 2 cans of crescent rolls, 1 cup butter, 1.5 cups white sugar, 1 tsp. ground cinnamon, and one can or 12 oz. bottle of Mountain Dew (I used diet, but you don’t have to – like it really even matters with this recipe). Simple, right? Preheat the oven to 350 degrees and lightly coat a 9″x13″ baking sheet with cooking spray. Peel and core the apples, then slice each apple into eight slices. 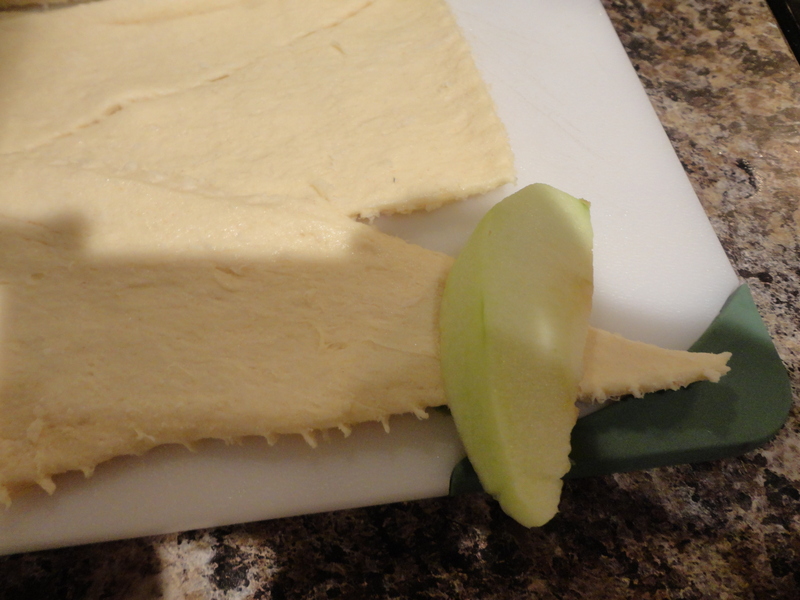 Separate the crescent rolls into triangles and roll each apple slice in a triangle, starting at the small end. Pinch the ends so the apple slice is sealed. Place on the baking sheet. Melt the butter in a small saucepan. 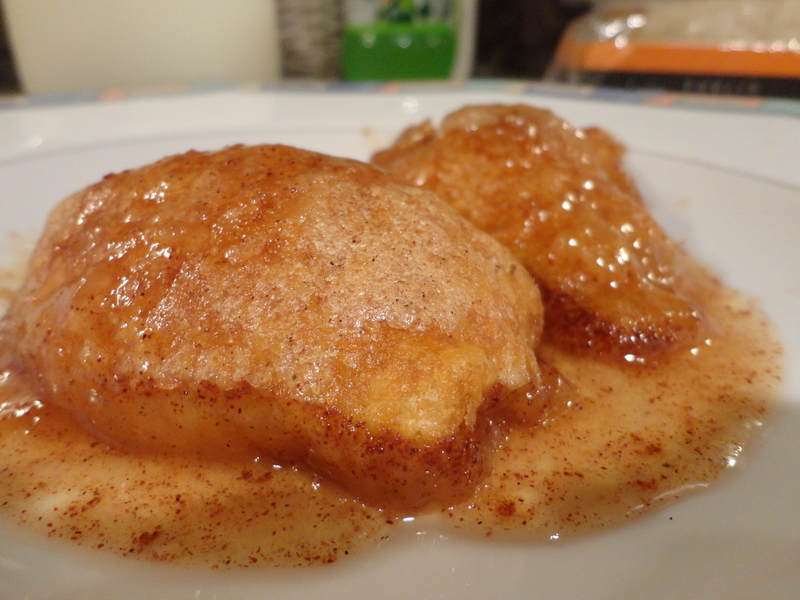 Once melted, stir in the sugar and cinnamon. Allow to melt enough so all the ingredients are evenly mixed together. The sugar will not be completely dissolved. 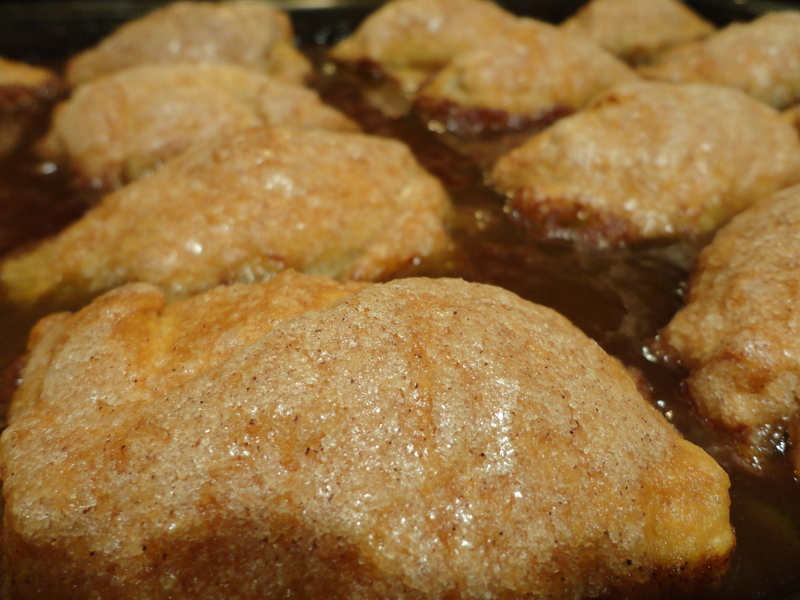 Pour the sugar mixture over the apple dumplings, covering evenly. Then, pour the Mountain Dew over the dumplings. I only used about half of the bottle, but you’re welcome to use the entire thing if you choose. Bake at 350 degrees for 30-40 minutes, or until golden brown. 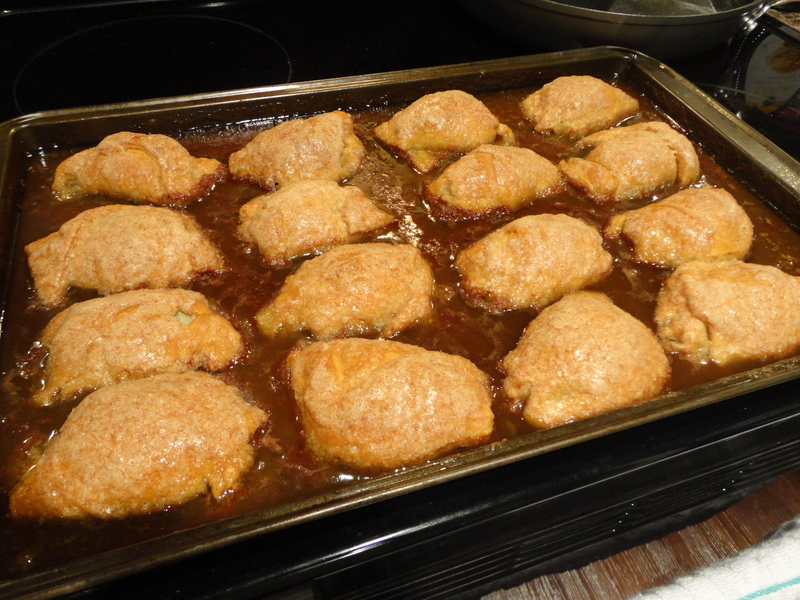 Remove from the oven and allow to cool 5-10 minutes. Enjoy with whipped cream, vanilla ice cream or by itself. And, of course, drizzle with the sugar sauce. 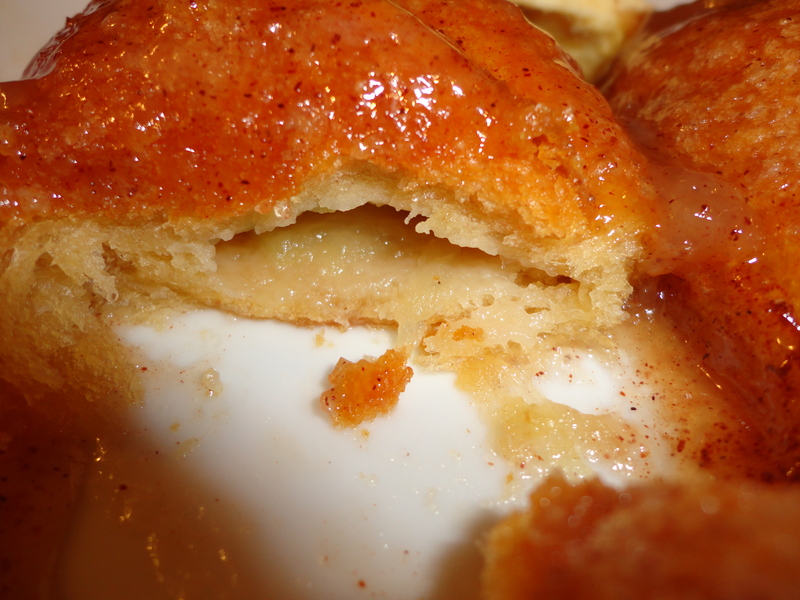 The outside is crisp and sweet, the inside is warm and gooey, and the apple is nice and tender. Yummy! Store any leftovers in the fridge and reheat in the oven at 350 for 5-10 minutes. I hope you enjoy! I came across this a few days ago and bookmarked it to come back after I bought some crescent dough. I made these and oh my gawd! They are amazing! I even told my sister about them, she made me make them for her. Even my grandmother made me write the recipe down so she could make it at her place! I am going to write a blog post on my blog and link it back to you because this needs to be shared! Thank you for this! I am so happy to hear that, Melissa!!! If grandma’s happy, everyone’s happy 🙂 I look forward to seeing your post on them, and hearing about any changes you made or suggestions you have! OMG — sounds yummy !!! !